German firm Siemens says it will make an offer for France's Alstom if it can see the company's books. The engineering firm wants access to Alstom's "data room" and "permission to interview the management" for four weeks as a prerequisite for an offer. On Monday, Siemens officials met French President Francois Hollande to discuss a possible deal. 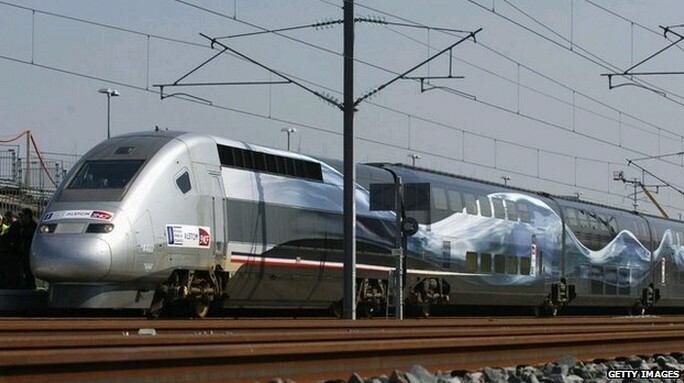 The news follows reports that General Electric (GE) wants to buy Alstom, which makes TGV high-speed trains. On Sunday, French newspaper Le Figaro reported that Siemens wanted to offer Alstom half its trainmaking business and some cash. In return, Siemens wants Alstom's energy industry turbines business, according to the report. Mr Hollande and senior French ministers met General Electric and Siemens on Monday in separate meetings. The politicians wanted "to make sure that French companies... do not become prey," France's economy minister Arnaud Montebourg said. Nevertheless, France is "open to alliances that help to equip [it] for globalisation", he said. Siemens chief executive Joe Kaeser also met Mr Hollande and Mr Montebourg, and described the meeting as an "open, trustful and amicable exchange". Alstom has about 93,000 employees in 100 countries around the world, and employs about 18,000 people in France. The engineering giant had to be bailed out by the French government in 2004, and has suffered heavy debts and a fall in orders over the past decade.